BoingBoing’s no-text post showing this image is titled “Fragmentary evidence of the lost ancient art of librarian miniaturization,” which counts as a shenanigan, I think. The image is all over the internet, sometimes with a citation to the Archives of Prague Castle. [UPDATE, November 14: I’ve just received an email from Martin Halata, head archivist at Prague Castle, who tells me the photograph is not from their archives.] It’s even got lolz versions in Czech [I found these a few days ago but now I can’t find them anymore and it’s driving me crazy]. Papier-mâché employees of the Internet Archive! The Internet Archive, home of the Wayback Machine and an enormous public-domain digital book collection, is housed in an old church in San Francisco. 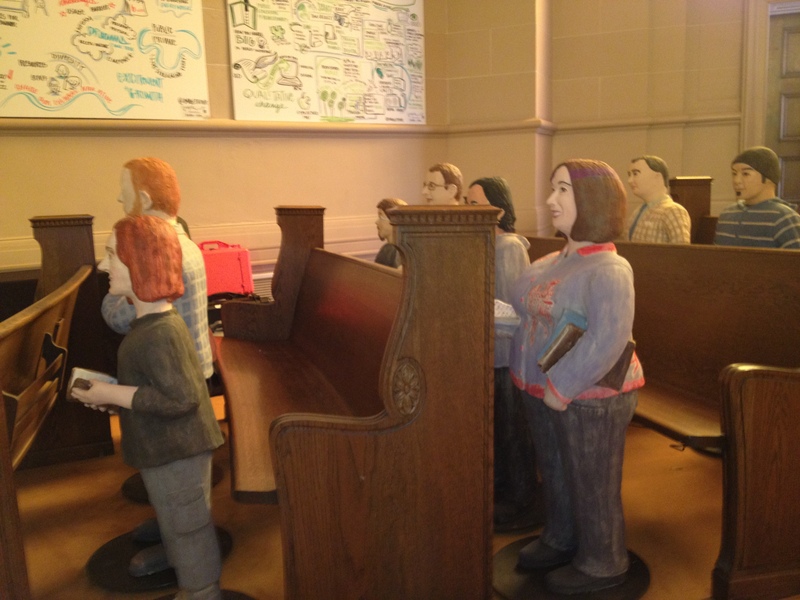 The pews of the church sanctuary are filled with papier-mâché representations of the employees! I haven’t been able to find out who made these or how it all came together or whether it’s a temporary thing — if you know anything about it, please comment. Thanks, Carol Dickerson! A hawk in the Library of Congress! An actual live hawk! A hawk somehow made its way into the Library of Congress this week. It has now been safely captured and will be released back into the wild. Thanks, David Weinstock! My researchers sometimes wonder why we don’t like to have pens in the reading room. Now you know one reason. (There’s also the problem of pen explosions.) Thanks, Leah Davis Witherow! So glad someone has gathered together these heroic librarians from books, TV, and film. In particular I call your attention to the bookaneers in China Mieville’s excellent novel Un Lun Dun. About time somebody wrote a novel where a prophecy is a crock. Thanks, io9! Archie Archives of the Regional History Center at Northern Illinois University dances at a Welcome Days event for first year students. Archie, your bright red bow tie is evocative of nerdiness and Chippendales at the same time, and goes very well with your flip flops … well done all around. And it seems the students like you. Thanks, Lynne Thomas! A 2008 commercial spawns an XKCD comic, which spawns a video, which spawns a Derangement and Description comic, which spawns a video at the Jewish Museum of Maryland. And every single thing in this chain is awesome (though only the last two are library shenanigans). Thanks, Lynne Thomas!